The producer Sunil Rawal is known to introduce new actors and produce successful movies. His first movie ‘Saayad’ was directed by Suraj Subba Nalbo and was very successful. He produced another successful movie ‘Hostel’. After the release of ‘Hostel’s sequel ‘Hostel Returns’, Sunil is now producing the sequel of his first movie ‘Saayad’. After the moderate success of ‘Bindaas’, the movie team had decided to produce the sequel of the movie. In a latest report, the lead actress Sushma Karki has signed in formally and the shooting is going to start soon. The lead actress of the movie, Sushma Karki had told that she received Rs. 3 lakh to do the first movie. For the sequel, there are conflicting reports of Sushma agreeing to do it for Rs. 2 lakh at first but in later days, the amount was ballooned to Rs. 5 lakh. Everybody knows, there is little truth on such a huge amounts and they use these statements for the advertisement of the movies. The producer of ‘Saayad‘, Sunil Rawal has announced that he will start the production of it’s sequel ‘Saayad 2’ after the release of his second movie ‘Hostel’. His upcoming movie ‘Hostel’ is made on the young generation youths and features second generation artists of Nepali movie industry. The hit Nepali movie ‘Saayad’ is a presentation of Durgish Film by Turgish Thapa. In addition to directing the movie, Suraj Subba has also written the script. The movie released in 2012 became a hit movie and establish Samyam Puri, the son of popular film director Narayan Puri, a new star in Nepali film industry. Encouraged by the success of the movie, the producer, Sunil Rawal, has also announced the sequel of the movie. We had also written the full review of ‘Saayad’ soon after its release. A number of movies scheduled to be released in the weeks ahead have postponed because of political uncertainty in the days ahead. At the time when the constitution is to be released (it is scheduled to be released on Jestha 14) various political parties have beefed up their demand and power shows. Frequent closure of businesses and transportation as a mean of protest, commonly named "Nepal Bandha" have affected the lives of every Nepali. Every sector including education, business, entertainment and public sector have been affected by frequent Nepal Bandha these days. Let’s talk about the cancellation of the release of a some of most awaited and hopeful Nepali movies because of Nepal bandha. Today, on May 5, 2012, ‘Saayad’ is being released in theaters across Nepal. But, due to Nepal Bandha its release in theaters outside the valley was postponed. Although the release in Kathmandu valley is going on as schedule, it is a bitter start as all the theatres are closed on the first day of it’s release. The producer of ‘Apabad,’ a movie scheduled to be released on Jestha 5 (May 18), has decided it is not the right time for the release and postponed the release date. The producer of ‘Apabad’, Susan Prajapati, has told that the release of the movie in USA and Australia will however be on the scheduled date. Release in Nepal will only be decided based on the political situation in the country. Similarly Pradip Uday, the producer of ‘Malatiko Bhatti’ has also announced the cancellation of the release of the movie previously scheduled to release on Jestha 12 (May 25). ‘Saayad’, ‘Apabad’, and ‘Malati Ko Bhatti’ were waiting for their release for a long time and at the final stage the release is affected by ‘Nepal Bandha‘. We hope, the political turmoil won’t affect the recent revival of the Nepali movie industry. 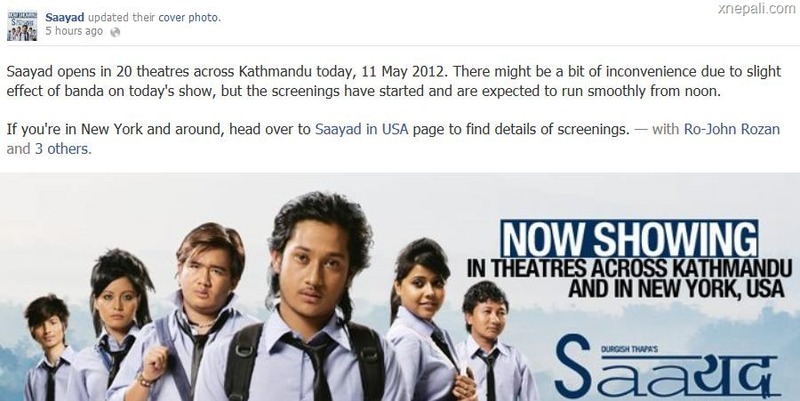 Nepali movie ‘Saayad’ is releasing on May 11, 2012. The movie directed by Suraj Subba “Nalbo” features Sunil Rawal, Samyam Puri, Wilsom Bikram Rai, Jharana Thapa, and Anita Daha in leading roles. The movie features the cinematoraphy of Sanjay Lama, music direction of the Shadows Band/Araaj Keshav Giri, choreography of Govinda Rai/Araaj Keshav Giri, editing of Bipin Malla, and story/script/dialogue of Suraj Subba “Nalbo”.